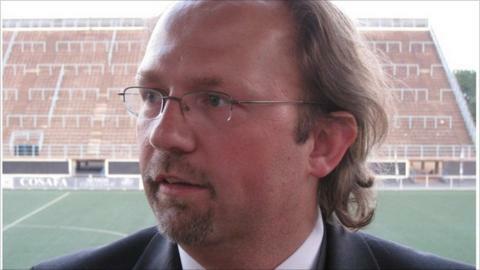 Tom Saintfiet tells BBC Sport he is confident he is the 'right man' to help put Nigerian football back on track. On Wednesday the Nigeria Football Federation (NFF) gave the Belgian a four-year contract as the country's technical director. "It doesn't matter where you worked before, it doesn't matter the age or the rich CV you have, " he said. "It's the quality you have and the determination and the way you want to work together and the knowledge." And the 39-year-old was quick to outline his role and ambitions as he returns to Africa after previous spells in The Gambia, Namibia and Ethiopia. Belgian Tom Saintfiet on his new role as technical director with the Nigeria Football Federation. "My main role will be to assist and advise the local coaches who are there [already], to create the circumstances, the structure and the ideas to reach our goals. ," he explained. "Nigeria has to be at the big tournaments and wants to win things. "My role will be to assist the coaches who are there to work together and reach our goals. "I'm looking forward to the task, I'm not losing sleep, I know my qualities, I've proved in the countries that I've worked that I can do a very good job and that I know African football." Saintfiet is well aware of the opposition and severe criticism that will greet his appointment. "I expect such questions, but let's not forget that the big names who worked in the last years in Cameroon, Ivory Coast and Nigeria for the World Cup, they under performed and even after that," he pointed out. "I'm a young boy, I'm 39 with 15 years of experience as coach, but that show that I have some quality and I know African football very well. "Let me remind you that former Chelsea coach Andres Villas Boas worked for Virgin Islands as coach and no one questioned if he would be the right person for Porto or Chelsea." Instead of challenging the opposition he says he is going to concentrate on working with all those involved in Nigerian football. "I'm very convinced that there are a lot of quality coaches in Nigeria. They have achieved a lot with the local clubs and qualifying for big tournaments," he said. "I would like to to work with them to take Nigerian football back to the big level and make them one of the big nations again in world football." One person who is unhappy with the choice of Saintfiet is former Super Eagles coach Adegboye Onigbinde, who led Nigeria at the 2002 World Cup finals. "Tom Saintfiet is not the right choice; he is a wrong choice for the position of national technical director," he said. "That is my personal position on the appointment, but I wish him the best of luck." But the NFF have defended Saintfiet's appointment. "We didn't get any Nigerians applying for this role and we expect our coaches to support Saintfiet," NFF board member Chris Green told the BBC. "As for the fans I think they should be patient with the NFF and the new technical director. The future is bright and we can't get there by pulling down positive and promising plans."